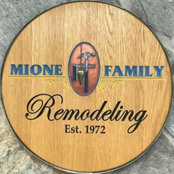 The Mione Family has provided Harrisburg homeowners, business owners and home builders with reliable carpentry services since 1972. We offer a complete range of professional carpentry services including door and windows, trim work, custom designs and general maintenance. Our reputation for quality craftsmanship, customer service and affordable pricing has helped us become a leader in the local industry. All Mione Family projects are designed and built by our own handpicked carpenters. Mione Family Guarantee: At Mione's we are committed to quality. If you are unhappy with our work, we encourage you to let us know. We are committed to ensuring that each customer is completely satisfied with our workmanship.